Getting started with an influencer marketing program can be an intimidating venture for a brand. With new information being released all the time, and examples of big-name companies finding success, it’s no surprise that misconceptions exist. 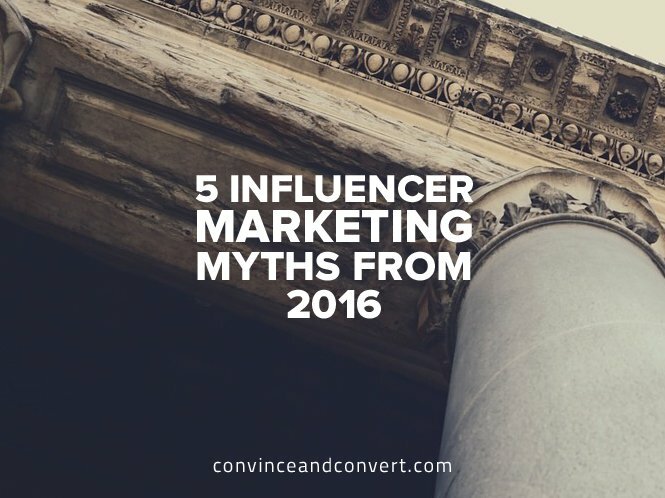 Below we address five common influencer marketing myths and explain why they’re wrong. As 2017 approaches, compensation is still one of the most asked-about topics in conversations around influencer marketing. Many content creators have spent years building loyal communities and solidifying their reputations as thought leaders, and they agree that providing their audience with quality content is more important than the paycheck itself. A few months ago, the Federal Trade Commission announced plans to tighten oversight around paid promotion disclosure. But is requiring influencers to disclose brand sponsorship really that important? The answer is yes. From Warner Bros to Lord & Taylor to the Kardashians, it seems no one is safe from the FTC’s recent crackdown on deceptive influencer sponsorship. Traffic from media to a specific site. Social shares of a post. When it comes to influencer marketing, bigger simply isn’t always better. Just because an influencer has a large following on social media doesn’t mean their content reaches and gets interacted with by the entire group. Working with a content creator who commonly posts about similar topics and has an active and loyal readership will always yield more engagement. There should be a compromise somewhere in the middle. You want someone in a niche that is related to what you are selling because they will be authentic and passionate and able to nurture their following. But you also want them to have a nice reach to help engage with the content. Rather than taking into account followers alone, InsightPool, an influencer-marketing platform, focuses outreach efforts on relevance, influence, and activity all together. Short form content in the form of Tweets, Instagram photos, or Pinterest pins are, as the label suggests, meant to be short in length and consumed quickly by the audience. The benefit of using short form content is to drive engagement and clicks, but the return is much shorter, and the lifespan of an average tweet, for example, is only 18 minutes. Long form, in comparison, is meant to give the audience a more insightful look into the topics. The benefits here are higher SEO rankings on Google search results and more social shares, with three thousand to 10 thousand-word posts gaining the most average shares. The best strategy is using them in conjunction with one another, as a way to push viewership and amplify rich blog content. Influencer marketing is notoriously dynamic and always changing. Identifying and learning about industry misconceptions are great places to start when developing an approach of your own. Noah is an Account Manager at GroupHigh. With a curiosity for the ever-changing climate of influencer PR and marketing, Noah has the opportunity to help his clients utilize GroupHigh's influencer identification and relationship management software in creative and strategic ways.